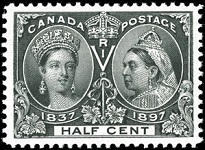 For Canada stamps, this brief period near the end of the reign of Queen Victoria saw the issue of two new series of definitive postage stamps, as well as the issue of Canada's first commemorative postage stamps. 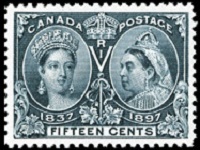 The big event of 1897 was the Diamond Jubilee of the reign of Queen Victoria, and to celebrate this event, a massive set of pictorial commemorative stamps was issued. Queen Victoria died at the beginning of 1901, after a reign of over 63 years, and her oldest son, Albert Edward, ascended to the throne as King Edward VII. 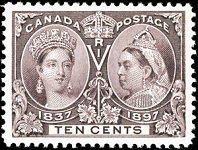 The printing of Canadian stamps with the portrait of Queen Victoria, however, continued into 1902, as the new definitive stamp plates with the portrait of King Edward VII were not used until 1903. The sixteen commemorative Canada stamps shown above (Sc. 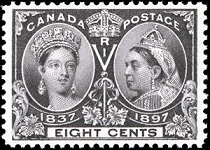 #50-65) were issued on June 19, 1897 to celebrate the 60th Anniversary of the Reign of Queen Victoria. All of these stamps are engraved, perforated 12, unwatermarked, and they were printed under contract by the American Banknote Company. 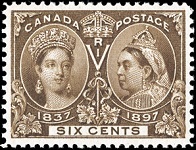 The common design features the 18-year-old Queen Victoria in 1837, from Chalon's coronation portrait, and a photograph of the 78-year-old Queen Victoria in 1897. 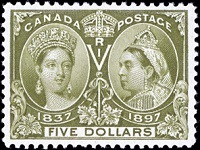 The stamps ranged in values from the 1/2 Cent denomination to the 5 Dollar denomination, with a face value of over $16.00. In 1897, this was a very substantial sum of money! The result was that very few of the high denomination stamps were sold, making them all scarce and very high priced today. 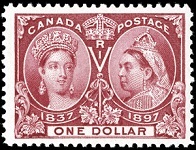 The very attractive series of definitive Canada stamps shown above were issued in 1897 and 1898. 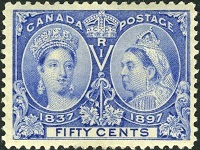 These new designs feature a contemporary portrait of Queen Victoria and maple leafs in each of the corners. 1/2 C. (1897 - Scott #66) - Black. 1 C. (1897 - Scott #67) - Blue Green. 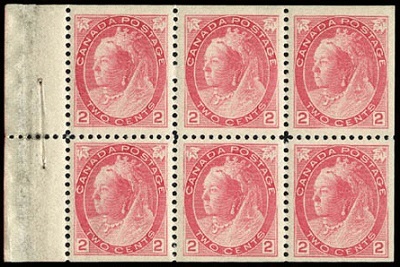 2 C. (1897 - Scott #68) - Purple. 3 C. (1898 - Scott #69) - Carmine. 5 C. (1897 - Scott #70) - Dark Blue on Bluish. 6 C. (1897 - Scott #71) - Brown. 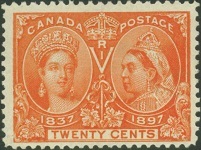 8 C. (1897 - Scott #72) - Orange. 10 C. (1898 - Scott #73) - Brown Violet. 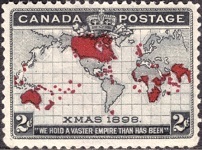 These re-designed definitive Canada stamps were issued between 1898 and 1902. The maple leafs in the lower corners were replaced by tablets containing the denomination numerals. Two new denominations were added, and some color changes were made as well. Their physical attributes are the same as previous issues. There are two types of the 2 C. denomination. Type I has a frame composed of four very thin lines. Type II has a frame composed of a thick line between two thin lines. 1/2 C. (1898 - Scott #74) - Black. 1 C. (1898 - Scott #75) - Gray Green. 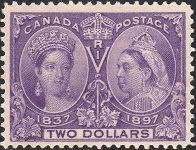 2 C. (1898 - Type I - Scott #76) - Purple. 2 C. (1899 - Type I - Scott #77) - Carmine. 2 C. (1899 - Type II - Scott #77a) - Carmine. 3 C. (1898 - Scott #78) - Carmine. 5 C. (1899 - Scott #79) - Blue on Bluish. 6 C. (1898 - Scott #80) - Brown. 7 C. (1902 - Scott #81) - Olive Yellow. 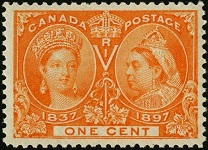 8 C. (1898 - Scott #82) - Orange. 10 C. (1898 - Scott #83) - Brown Violet. 20 C. (1900 - Scott #84) - Olive Green. 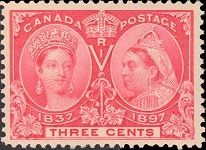 Canada's first vending booklets were issued in 1900, utilizing the 2 C. carmine Type II stamps. One of the panes is shown above. 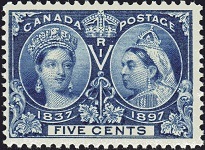 The two stamps shown above (Sc. 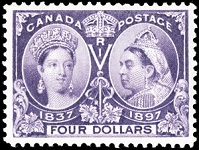 #85-86), each with a different colored background, were issued on December 7, 1898 for the Inauguration of Imperial Penny Postage (Letter postage to nations within the British Empire). 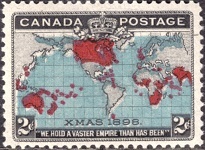 The design features a Mercator map of the World, with the countries of the British Empire colored in red. These stamps were valid for all classes of mail, whether they be imperial postage letters, domestic letters, or foreign letters. 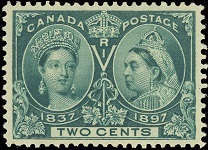 The two re-valued stamps shown above (Sc. 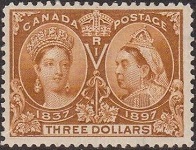 #87-88) were issued in July 1899, due to a shortage of 2 C. denomination stamps.